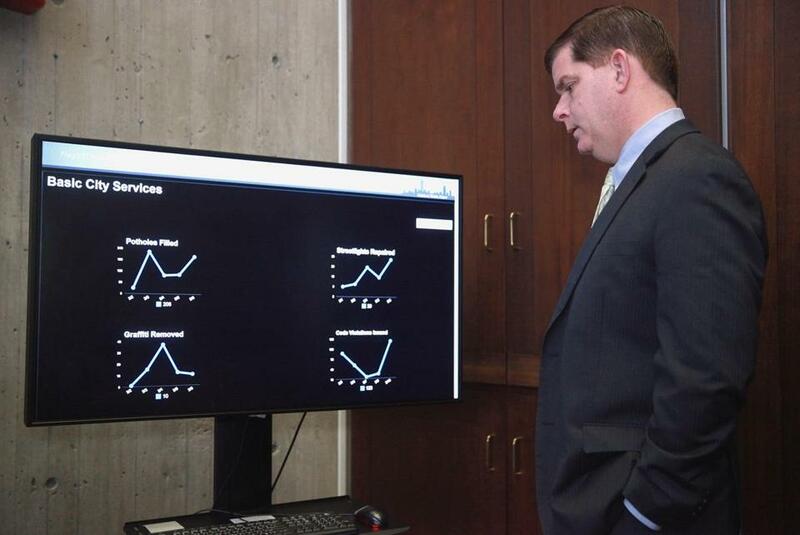 Mayor Martin Walsh looked over a data dashboard in his City Hall offices in March. According to a recent Harris poll, Americans ages 18 to 44 believe that five years from now most interactions with cashiers, cab drivers, and waiters will be handled by online apps. They think there will be “big data” health services that provide real-time medical monitoring and alert their doctors when they’re in danger. And they’re confident they will be asking for help from companies who can send them needed products before they have to order them. This streamlined future will happen on the streets of America’s cities, where more than 80 percent of us live. Municipalities are just starting to use data to improve urban conditions. Imagine a local government that could handle its citizen interactions seamlessly online, predict traffic problems, air quality issues, well-being deficits, and other needs, and allocate resources preemptively where they were most needed. This new data-driven responsiveness faces obstacles in the form of concerns about Big Brother survelliance and bureaucratic rigidity which, unless they are resolved, will make government anachronistic at a time when democracy needs to instill confidence and trust. Linda Gibbs, former New York City deputy mayor and one of the country’s foremost advocates for children in need, tells the story of a homelessness services worker who went to check on clients who had recently left a shelter for an apartment. When he arrived, he saw that the mother of the family was having a crisis. He was relieved to see that the mother’s substance abuse counselor was also there — he thought they would be able to share information about the mother’s condition and get her the help she needed. But then the substance abuse worker, thinking that any observation of her presence in the apartment was a breach of confidentiality, ran out the door. Gibbs points out that laws designed to protect confidentiality, mechanically applied, can get in the way of helping people. Federal laws prevent sharing of information among state workers helping the same family. In one state’s public health agency, workers fighting obesity cannot receive information from another official inside the same agency assigned to a program aimed at fighting diabetes. In areas where citizens are worried about environmental justice, sensors collecting air quality information are feared — because they could monitor the movements of people. Cameras that might provide a crucial clue to the identity of a terrorist are similarly feared because they might capture images of innocent bystanders. In order for the public to develop confidence that data tools work for its betterment, not against it, we have work to do. Leaders need to establish policies covering data access, retention, security, and transparency. Forensic capacity — to look back and see who had access to what for what reason — should be a top priority in the development of any data system. So too should clear consequences for data misuse by government employees. If we get this right, the payoffs for democracy will be enormous. Data can provide powerful insights into the equity of public services and dramatically increase the effectiveness of social programs. Existing 311 digital systems can become platforms for citizen engagement rather than just channels for complaints. Government services can be graded by citizens and improved in response to a continuous loop of interaction. Cities can search through anonymized data in a huge variety of databases for correlations between particular facts and desired outcomes and then apply that knowledge to drive toward results — what can a city do to reduce rates of obesity and asthma? What bridges are in need of preventative maintenance? And repurposing dollars from ineffective programs and vendors to interventions that work will help cities be safer, cleaner, and more effective. The digital revolution has finally reached inside the walls of city hall, making this the best time within living memory to be involved in local government. We believe that doing many small things right using data will build trust, making it more likely that citizens will support their city’s need to do big things — including addressing economic dislocation. Data rules should genuinely protect individuals, not limit our ability to serve them better. When it comes to data, unreasoning fear is our greatest enemy.